Going green is becoming a very politically popular topic these days. Saving money is an every day topic. There is little doubt that the world is looking for cleaner and more responsible products to use in nearly every facet of life. 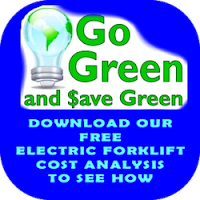 That, along with the sudden surge in the cost of petroleum fuels, is making your understanding of the benefits of alternative fuel powered forklifts even more important. The most viable and readily available technology today is battery operated electric forklifts and they can save you money. Most consumers have avoided this alternative for many years. Why? 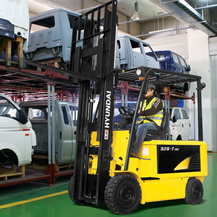 Because the acquisition cost of an electric forklift is much higher than a gas/lpg forklift. Sometimes electric forklifts can cost as much as 30% more than a comparable gas forklift. Unfortunately, this is only one piece of the equations and a very short term view of the total cost of owning a forklift. If you are interested in finding out more on this subject, we have the tools you can use to make the comparison and prove it to yourself.